What is gastric outlet obstruction? Gastric outlet obstruction (GOO) is a condition where the opening between the stomach and small intestine is blocked either partially or completely. This portion of the stomach where the blockage is located is known as the pylorus, hence the alternative term for gastric outlet obstruction – pyloric obstruction. It is not a disease but rather a consequence of some underlying disease involving the stomach and more specifically the pylorus of the stomach. Food and fluid enters the stomach from the esophagus through the top of the stomach known as the cardia. It is then mixed with stomach acid and digestive enzymes. Strong muscular contractions of the stomach churns the food with these enzymes. This assists with chemical digestion but also helps break down the food into smaller pieces as part of mechanical digestion. Eventually it is transformed into semi-solid mixture which is then pumped out of the stomach through the pylorus. Larger solids remain behind in the stomach until it is broken down further. When the outlet of the stomach is blocked, this semi-solid mixture known as chyme cannot be pumped out of the stomach as easily. The obstruction to outflow coupled with the strong stomach contractions can push the chyme upwards into the food pipe and mouth. Therefore a person presents with vomiting in gastric outlet obstruction. This may not be constant and is dependent on what a person eats. Fluids are better tolerated as it can pass around the obstruction to empty into the duodenum (first part of the small intestine). Solid foods are usually the problem. As the condition progresses, weight loss may become noticeable. In the late stages when the condition is severe, a person may also suffer from malnutrition as insufficient food is consumed. Food that may accumulate and take long periods to pass out of the stomach causes the stomach to stretch. In the process the stomach loses its ability to contract strongly when it is filled with foods. The stomach then has even greater difficulty in pushing partially digested food into the duodenum. This can pass out backwards and even empty into the lung. The blockage may classified as intrinsic or extrinsic. Although the term gastric outlet obstruction refers to the stomach, sometimes the cause of the obstruction is located within the small intestine and hampers the exit of the stomach contents. An intrinsic blockage is where the obstruction lies inside the stomach or duodenum. This may include masses and lesions which cause narrowing within the stomach and duodenum such as polyps and ulcers. An extrinsic blockage is where a mass or enlargement of an organ lying around the stomach and duodenum compresses and narrows the stomach outlet. This is seen mainly in tumors of the pancreas and gallbladder. The causes of gastric outlet obstruction can be broadly classified as benign (non-cancerous) or malignant (cancerous). This category includes all the non-cancerous causes of gastric outlet obstruction. Peptic ulcer disease (PUD) is the most common cause. 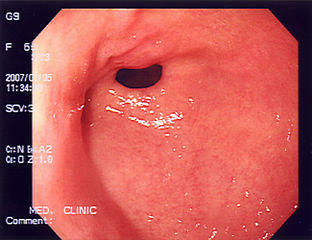 It is the open sores that form in the wall of the stomach outlet (pylorus) or duodenum. Narrowing in acute ulcers are a result of the swelling of the affected area. In chronic cases, scar tissue forms in the affected area and this cause a localized narrowing. Stomach polyps are growths within the stomach wall. Smaller polyps are usually benign but larger polyps have the potential to become cancerous. It is a rare condition that is linked to chronic gastritis and long term use of acid-suppressing medication known as proton pump inhibitors (PPIs). Pyloris stenosis simply means narrowing of the pylorus. It is a more common cause of gastric outlet obstruction in babies and children. 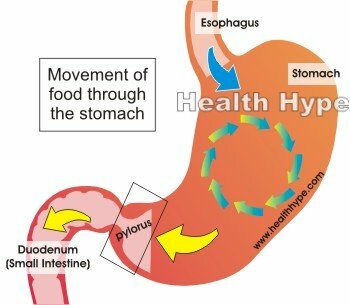 The muscles of the pylorus becomes abnormally thickened thereby narrowing the stomach outlet. It is usually a congenital problem meaning that it is present from birth. Duodenal webs are a rare cause of gastric outlet obstruction. It is present from birth when a membrane with a central hole forms inside the stomach outlet thereby creating a partial obstruction. Gallstone obstruction (Bouveret syndrome) is where a gallstone become stuck in the stomach outlet or first part of the duodenum. Most gallstones pass out without any such impaction but a very large stone can cause a blockage. Overall thought, it is rare. Pancreatic pseudocysts are not true cysts because it lacks the inner lining found in a regular cyst. These pockets are filled with digestive enzymes. Most cysts in the pancreas are pseudocysts and can vary in size. Larger pseudocysts are more likely to cause gastric outlet obstruction. Bezoars are masses that are stuck in the stomach outlet. It can be undigested pieces of food, medication, hair or indigestible foreign objects that are swallowed. It can be removed and normal movement through the stomach is then immediately restored. Pancreatic cancer which is the main type of malignancy which causes blockage of the stomach outlet. Ampullary cancer which is a cancer in the last part of the common bile duct that carries bile into the duodenum. Cholangiocarcinoma which is a malignancy in any part of the bile duct system. Stomach cancer particularly when the malignancy is in the pylorus of the stomach. Metastatic cancers which spread from other sites to the stomach or duodenum to lead to a blockage. The early symptoms where the partial blockage does not significantly hinder movement of food out of the stomach will cause little to no symptoms. A person may not be aware of the condition in these cases. The initial symptoms are largely due to delayed gastric emptying. However, as the obstruction progresses then the symptoms become severe often linked to the complications of gastric outlet obstruction. Vomiting after eating, usually within an hour after consuming a meal with solid foods. Vomit containing undigested food particle. Nausea is usually present but may occur without any vomiting. Pain in the upper middle abdominal area (epigastric region) which may not always be present depending on the cause of the obstruction. Bloating which is a sensation of fullness in the upper abdominal region. Early satiety where a person feels full after eating just a few bites of food. Moderate weight loss that may not raise any concern. As the condition worsens, then additional symptoms may be noticed in addition to the early symptoms. Dehydration due to excessive vomiting. Changes in bowel movement like constipation. Changes in blood chemistry like hypokalemia and metabolic alkalosis due to severe dehydration. Other symptoms may also be present which are not due to the obstruction itself but the cause of the obstruction. The patient’s medical history and findings of a clinical examination may be sufficient to make a preliminary diagnosis of gastric outlet obstruction. However, further tests are needed to confirm the diagnosis and to isolate the cause. The main route for investigation involves various imaging studies like an x-ray or upper gastrointestinal endoscopy. Blood tests may assist with monitoring the complications like changes in blood chemistry. An x-ray is usually the first imaging study that is conducted which reveals a possible obstruction. The stomach appears distended as food accumulates in it and sometimes the stricture (narrowing) may be visible especially if it is calcified. A barium meal, also known as a barium swallow, is one of the preferred methods of conclusively identifying an obstruction. By swallowing a solution known as barium sulphate, the stomach, duodenum and obstruction can be highlighted on a x-ray. It will not necessarily assist in identifying the cause of the obstruction. An upper gastrointestinal (GI) endoscopy is the preferred method of confirming an obstruction and even identifying a possible cause. A thin flexible tube with a camera and light source at the end is inserted through the mouth, down the esophagus and through the stomach to the site of the obstruction. It will not only allow for visualization of the obstruction but a tissue sample (biopsy) can be taken and analyzed further. Gastric outlet obstruction usually needs to be treated surgically if it does not resolve within a few days. Medication offers little benefit in gastric outlet obstruction. Drugs to speed up movement through the upper gut, known as prokinetics, should not be used. Acid-suppressing drugs like proton pump inhibitors and H2-blockers may be helpful in reducing the irritation to the stomach and duodenum. This will help ease swelling of the area and allow it to heal in the case of peptic ulcer disease. Supportive treatment is crucial in severe cases. An IV drip can help with dehydration and a nasogastric tube will aid with removal of the stomach contents. Endoscopic balloon dilatation temporarily widens the stomach outlet but is only helpful if the underlying cause is simultaneously treated. Antrectomy is where a portion of the lower part of the stomach (antrum) is surgically removed. It is usually done along with a vagotomy and sometimes in combination with a gastrojejunostomy. Pyloroplasty is a procedure that widens the outlet of the stomach (pylorus). It may be done on its own or along with a vagotomy. Vagotomy is where a part of the vagus nerve is surgically cut (resection) and this helps to reduce stomach acid secretion. It may be done on its own, with an antrectomy or with a pyloroplasty. It is rarely done with an endoscopic balloon dilatation due to risk of complications. Gastrojejunostomy (Biliroth II reconstruction) is where the stomach is connected to the second part of the small intestine known as the jejunum thereby effectively bypassing the duodenum. It can be done with an antrectomy and vagotomy for the best results.